Do you like food ? Are you a local producer ? WE NEED YOU to help us set up a non profit making community based business to link those who produce the food to those who buy the food . Help to keep the money in the community , reduce food miles and get great food into the bargain. The Big Lottery rolled North into Caithness last week when they came to visit a new project which they are supporting right here in the county. Caithness Food for Thought based in Wick and at their growing site at Spittal were the focus of their trip. The Big Lottery and Grampian and Highland Health Board contingent were very impressed by what they saw and tasted. The Food for Thought Caithness growing trial programme based at Spittal has been up and running since May of this year and aims to provide the community of Caithness with fresh vegetables salad crops and herbs. At present the project has two twin walled polythene tunnels and open ground beds which have been in full production over the summer. With the aid of the tunnels the development officer and his team hope to extend the growing season. 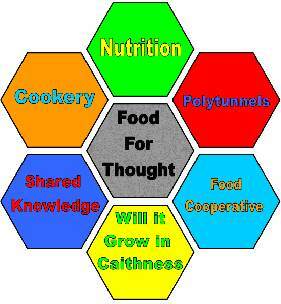 As part of the project, Food for Thought Caithness have teamed up with Health and Happiness Highland. They aim to work together to develop the growing programme. In addition to the growing programme Food for Thought Caithness have been active in other areas of positive food promotion throughout the county in the past year. We have run several successful fruit tasting sessions in schools and local community groups offering participants the opportunity to try unusual and exotic fruits seldom seen in Caithness. We have worked with the ethnic community of Caithness to run an Indian cookery course and tasting session. We hope to repeat this venture with other members of the community in the near future.